The fixed income portion of a retirement portfolio. This article was posted September 1, 2013. Despite several years of near zero percent interest rates for savers, just about every retiree will want to hold some portion of their retirement portfolio in fixed income securities. The question is how much to allocate to fixed income assets and which fixed income alternative to buy. How much of a retirement portfolio should be in fixed income? The classic retirement allocation is 60% stock/40% fixed income, and what you can expect to safely withdraw on an inflation-adjusted basis drops rapidly from there as you increase the allocation to fixed income. A retiree with a 30% stock/70% fixed income portfolio should probably try to limit his initial withdrawal to about 3% of assets. 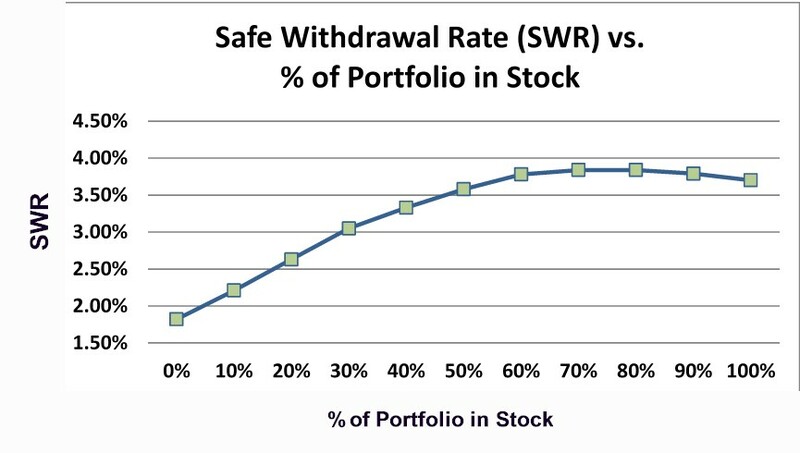 A 100% fixed income investor is at risk with even a 2% withdrawal rate. The chart below illustrates this relationship. income portion invested in 3-month commercial paper, 30-year payout period. Retirees should also consider that most already have a sizeable allocation to fixed income in the form of a monthly Social Security check (and perhaps a pension if they're lucky.) As of December 2012, the Social Security Administration puts the average monthly Social Security check at $1,262. It would cost a 65-year-old male about $300,000 to buy an inflation-adjusted life annuity with the same monthly benefit from an insurance company (about $325,000 for a 65-year-old female.) There is little reason to double-down on fixed income by forsaking a reasonable allocation to stock in your retirement portfolio. (Individual Bonds) None None 5 1 Cost-free through Treasury Direct. Broker may charge a commission. US Treasury Securities (Nominal) None None 5 1 You can buy them cost-free through Treasury Direct. Broker may charge a commission. US Savings Bonds (I-bonds) None None 5 1 You can buy them cost-free through Treasury Direct. US Savings Bonds (Nominal) None None 5 1 You can buy them cost-free through Treasury Direct. Bankrate.com is good souce for rates. Corporate Bonds (Individual Purchase) 2.00% None 1 to 4 2 to 5 Buy/Sell cost could be higher if you have to sell quickly. Municipal Bonds (Individual Purchase) 2.00% None 1 to 4 2 to 5 Buy/Sell cost could be higher if you have to sell quickly. Single-Premium Annuity (Period Certain) up to 5.00% None 4 2 to 3 High-commission fixed annuities tend to have lower investment returns. Single-Premium Annuity (Life) 20% to 25% None 4 1 Hidden costs of 20% to 25% for people of average mortality. Costs are lower if you live to a ripe old age. You can buy these bonds either as individual securities through Treasury Direct (free) or a broker (for a fee.) Or you can buy a mutual fund that invests in Treasury Bonds or TIPS. Unlike municipal or corporate bonds, it's not necessary to diversify your investment in US Treasury securities, so make sure the additional cost you pay for a mutual fund is worth whatever convenience it provides. I-Bonds are another type of inflation-adjusted security you can buy from Treasury Direct. The current yield (base rate plus inflation) is 1.18% and it's reset every 6-months. There is a purchase limit of $10,000 year for book entry bonds and $5,000 for paper bondsOr you can buy a mutual fund that invests in TIPS. Here's a good summary of the difference between I-bonds and TIPS. I-Bonds can be a good value vs. TIPS. 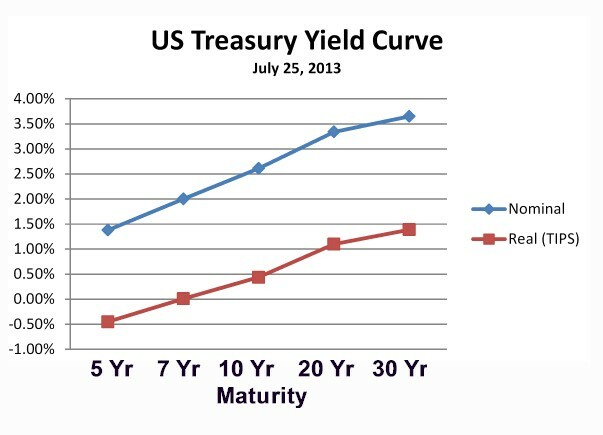 (The current fixed rate of 0.00% is almost half a percent higher than the 5-Year TIPS yield of -0.45%. However, with the $10,000 purchase limit, they're likely lost in the round-off for a typical early retiree portfolio with hundreds of thousands (or millions) in fixed income securities. FDIC-insured CDs are just about as safe as US Treasury Securities. Though, since they are subject to state income tax (which US Treasury securities are not) you might need to get a higher interest rate to make them competitive. Currently (as of 01/14/2014), the Pentagon Federal Credit Union (www.penfed.org) has some of the highest CD rates in the nation. Ordinarily you have to have some connection with the military to join. But there is a little known exception. You can join the National Military Families Association for a one time membership fee of $20 or Voices for America's Troops for a one time membership fee of $15. Diversification is important if you hold corporate or municipal bonds. Unless your retirement nestegg is so large that you'll be buying more than $1 million in bonds, you should probably only buy these securities in the form of a well-diversified mutual fund. Hidden transaction costs for small purchasers of individual bonds can trim as much as 2% off the value of the bond -- more if you have to sell in hurry. The risk and return of corporate and municipal bonds varies widely based on the credit quality of the issuer. And fewer people have confidence in the work of ratings agencies like Standard & Poors or Moody's after the abuses and frauds leading up to the 2008 financial collapse. Buying individual bonds may not be worth the added transaction costs and risk versus participating in this market theough a low-cost mutual fund. Period certain annuities can be a good deal if you can find one with a higher interest rate than a corporate bond with equivatent risk. Though they are heavily promoted by financial advisors, immediate life annuities are among the highest cost fixed income alternatives you can buy. For a 65-year-old male of average mortality (expected median age at death = 82), about 25% of the purchase price of the annuity is lost to the insurance company's various fees, expenses, and costs. If we look at a healthier population of 65-year-olds that beat the average by 4 years (i.e., expected median age at death = 86) the hidden costs drop to about 10% of the premium paid. By comparison, if you invested the annuity pool in a portfolio of index funds with a 15 basis point annual cost, the present value of 50 or 60 years worth of fees would be less than 2% of the premium paid. Only about 1% of retirees buy immediate life annuities. Fortunately, most people seem to instinctively know that they're a bad deal. What conclusion to draw from this data? My long-held preference for the fixed income portion of my retirement portfolio was a ten-year ladder of FDIC-insured Certificates of Deposit. An FDIC-insured CD offers basically the same safety as a Treasury bond and you can usually find one with a higher yield than a Treasury security of the same maturity. But when the Federal Reserve decided to recapitalize the banks by forcing short-term interest rates to near zero, it wasn't worth the time to shop for a high-yield CD. Since 2009, I've held most of my fixed income assets in a Vanguard Short-Term Corporate Bond Fund (VFSUX). A single premium immediate life annuity is a bad deal for almost everyone. Of course, none of us know when we'll die. And few have any reason to believe that their longevity will diverge widely from the median. I'd only consider a life annuity purchase if I was in perfect health and my parents and grandparents lived well into their 90's -- and even then I'd think twice about it. Copyright � 2013 John P. Greaney, All rights reserved.